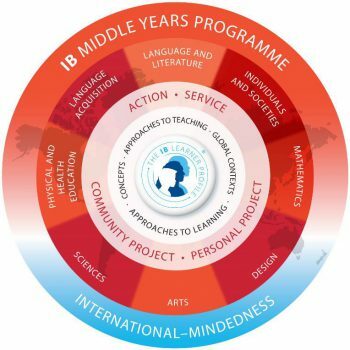 The IB Middle Years Programme is an educational framework developed for students in grades 6-10 to gain an understanding of the fluidity of knowledge between subject areas. Additionally, we work to develop students to become critical and reflective thinkers. The final culminating piece, the personal project, allows for students to showcase their talents and knowledge gained over the five years in the programme. Approaches to Learning (ALT) is central to the programme, as it is concerned with developing the intellectual discipline, attitudes, strategies and skills which will result in critical, coherent and independent thought and the capacity for problem solving and decision making. It goes beyond study skills, having to do with learning how to learn and with developing an awareness of thought processes and their strategic use. Community Service (CS) starts in the classroom and extends beyond it, encouraging responsible, caring participation in the local environment and in the wider world. The emphasis is on developing community awareness and concern, a sense of responsibility, and the skills and attitudes needed to make an effective contribution to society. Global Contexts (GC) Students learn best when their learning experiences have context and are connected to their lives and the world that they have experienced. Using global contexts, MYP students explore human identity, global challenges and what it means to be internationally – minded.